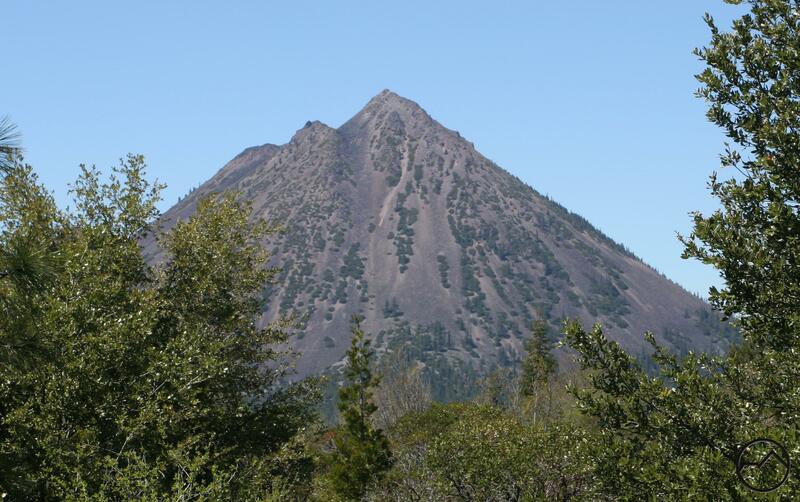 A surprisingly long trail up Spring Hill, a prominent butte at the north end of Mount Shasta City. 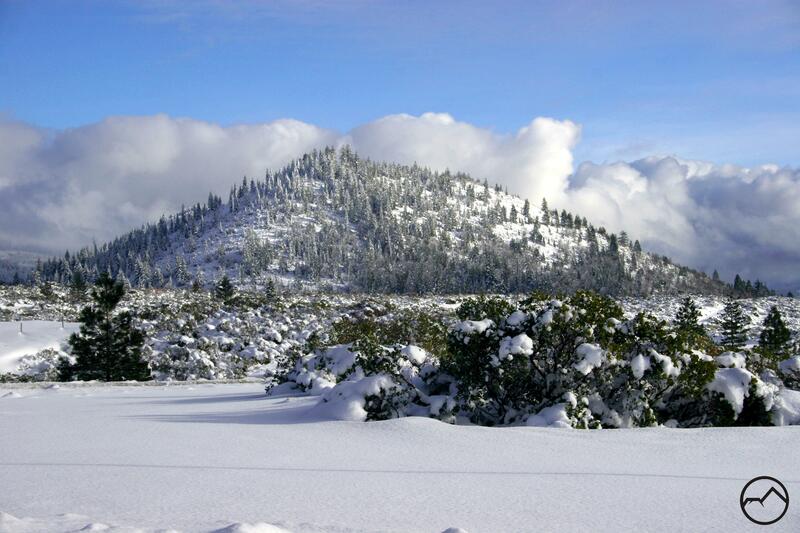 Vistas on the summit plateau offer great views of the Trinity Divide, Strawberry Valley and Mount Shasta. 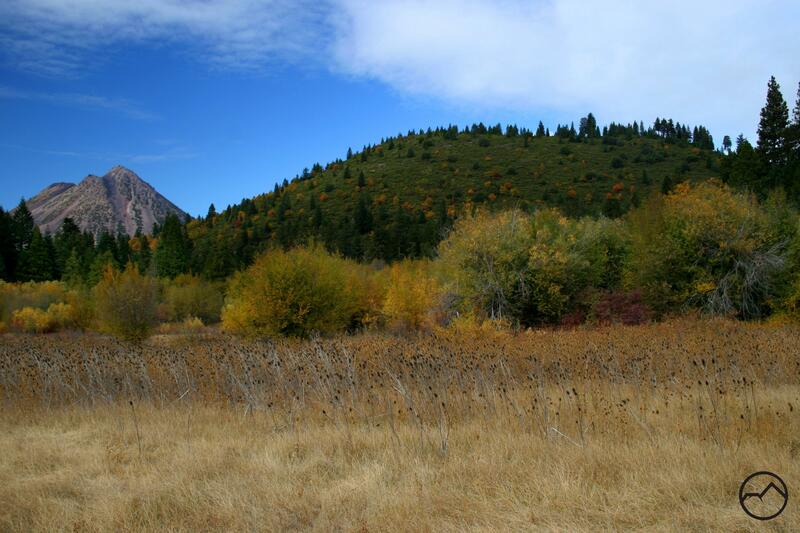 The Spring Hill Trail is one of the trails most conveniently located to Mount Shasta City. 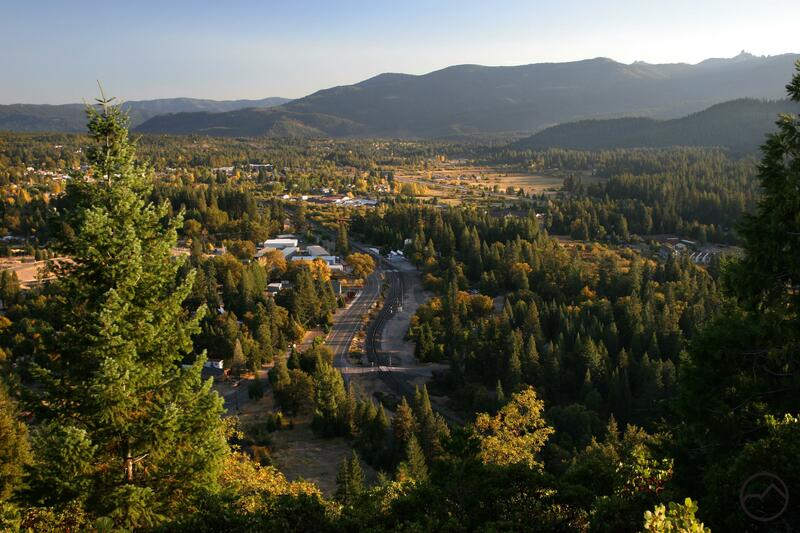 Spring Hill is visible from most of town, a seemingly younger sibling to conical Black Butte and might Mount Shasta. Although the small butte is easily viewed, many do not know that a trail now winds its way to the summit, offering great views along the way. Looking at Spring Hill, one would not expect a long trail to reach the summit. Surprisingly, the trail is almost three miles long, though it is not very steep. The length is a result of the long, lazy switchbacks that are used to lessen the trail’s grade. A recent addition of a 0.4 miles loop around the summit plateau also contributes to the trail’s length. The trail is a great option if one is staying in town or has limited time. The quick trailhead access and the easy trail are ideal for a quick trip. The views are great, with numerous vistas along the trail. 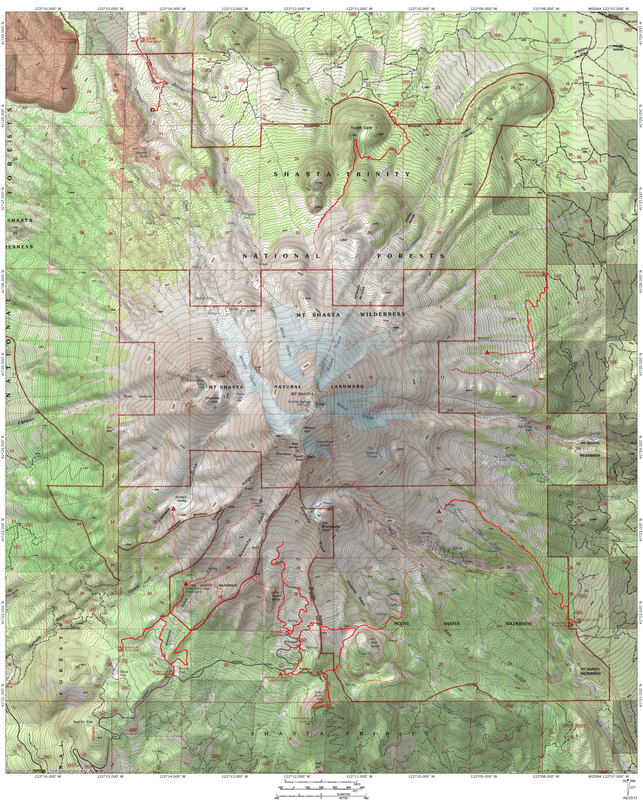 In particular, the view of Mount Shasta City, nestled in the Strawberry Valley and flanked by Mount Shasta and the Trinity Divide is excellent. A bonus is the great view of Mount Shasta from Rocky Point on the east side of Spring Hill. The land traveled by most of the Spring Hill Trail belongs to the Coca-Cola Company. Please be respectful of the land and do not leave any trash or vandalism. The access to the land is permitted but should misuse arise, access may be withdrawn. Mount Shasta from the Spring Hill Trail. The Spring Hill Trail begins at the end of a short residential street. The parking area is a roundabout. The trail itself departs from between two rocks on the west side of the parking area. It heads west, staying level very briefly before it doubles back to the east and starts to climb Spring Hill. After a short climb, the trail enters a small copse of trees and then tops off at a junction with an old dirt road. From this point on, the old road and the trail are one for most of the way to the top. For those that do not like road hiking, this should not be a discouragement. The road is not very wide, a single-track path is developing with use and the Rocky Point Loop, one of the highlights, is a classic trail cut through thick brush and winding around rock outcroppings. Once at the road, turn to the left. The road makes a quick switchback to the right and begins the longest single leg of the whole trail. This section of trail has no views and is flanked by dense forest. Snow often lingers on this section of trail. After 0.3 miles, the trail switchbacks to the left. At the switchback, there is a bench with a good view hidden behind some brush. The next leg of the trail is the second longest, climbing 0.25 miles. At the next switchback, there is another bench, this time with a great view of Mount Shasta City and the Strawberry Valley. This is one of the best vistas of the entire trail. Continuing to climb, the trail has two more, shorter switchbacks before finally leveling off on the summit plateau. The mixed forest of earlier sections of the trail now gives way to a more open ponderosa pine forest. Black Butte from the summit of Spring Hill. Shortly after reaching the summit plateau, the trail arrives at the junction with the Rocky Point Loop. This is a great addition to the trail. One can do it now or on the return trip. 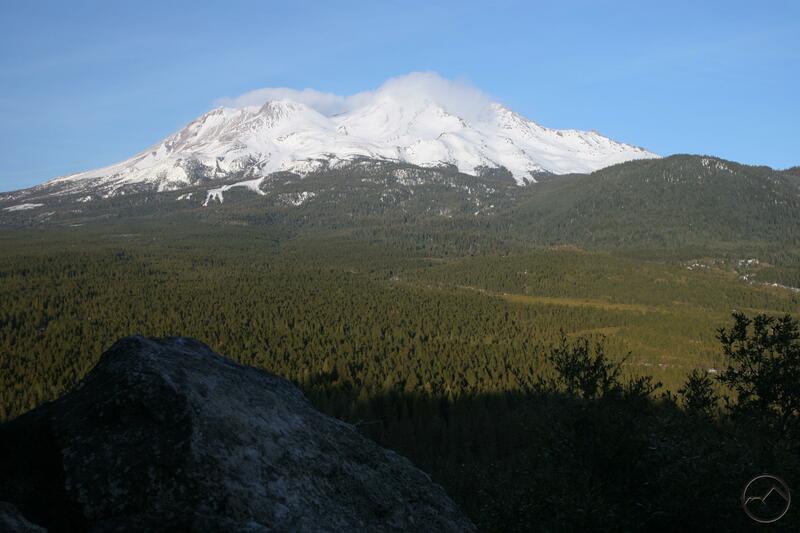 The order depends on whether one wants a view of Mount Shasta now or as a climax to time spent on the summit plateau. This trail description will leave it for the end. Proceeding on the trail, it continues through open forest for 0.15 miles before switchbacking yet again. Look for the Rocky Point rejoining the main trail here. A short distance is another switchback, and swiftly a third and final switchback. A short distance away, picnic tables dot the top of Spring Hill. The furthest has the best views, as it is close to the precipice marking the end of the Spring Hill Trail. The views are great and this is an excellent place to have a picnic. Mount Shasta from Rocky Point. Heading back, descend the switchbacks to the junction with the Rocky Point Trail, which is at the third switchback. Here the trail heads north then briefly south before beginning a long straight leg to the east. This skirts the boundary with Shasta-Trinity National Forest, which owns the northeast corner of Spring Hill. Brush is thick on both sides of the trail, which was hacked out of extremely dense brush. Soon the trail turns to the south and eventually tops out at Rocky Point. A small group of rocks hang precipitously over the sheer east side of Spring Hill. 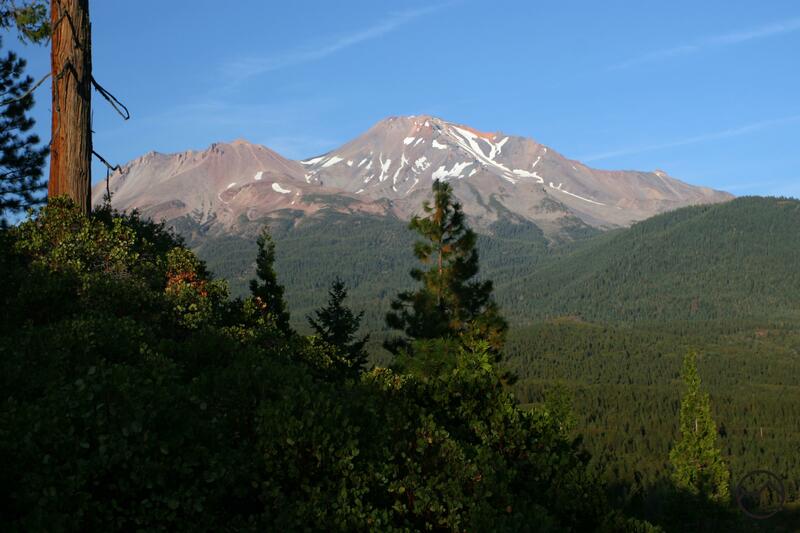 The rocks offer what is possibly the best view of the trail, which is an unobstructed view of Mount Shasta. The view is best in the afternoon. From Rocky Point, the trail heads back to the southwest, where it rejoins the main trail. Black Butte and Spring Hill from Mount Shasta City. Head north on Mount Shasta Boulevard to the north end of town. Just after the Mount Shasta Animal Hospital, turn right onto Ski Village Dr. The road immediately turns left and then Ski Village immediately turns right. Stay straight, onto a short street. The parking area is at the end of the short street. 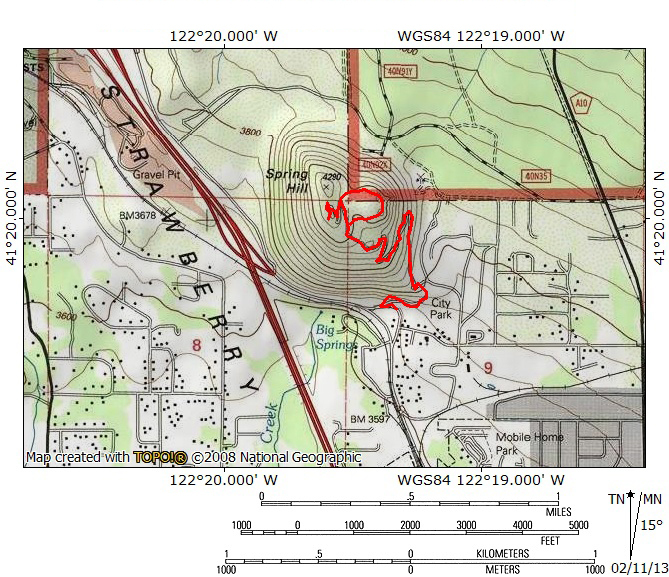 Trail access cannot be withdrawn by the water bottling company that owns Spring Hill. The public has a right to use it for recreational purposes. This formerly labeled ‘jeep trail’ has existed on USGS maps before 1950. In 2000, a California court decided Friends of the Trail v. Blasius. A similar trail was ordered to remain open to the public after the land owner tried to close it off. Is this hike 3 miles to the summit or 3 miles round trip? 3 miles round trip, if that. Very short hike overall.